The museum group in Trondheim (SHF, earlier TSHF) was established in 1979, in time to rescue most of the big collection of veterans still existing in Trondheim. For some reason Trondheim always had a tradition of storing most old cars away, and not scrapping them. Voldsminde depot was always the depot in which they were kept. (This tradition actually saved the Trondheim tram system after the fire in 1956 when a fleet of old cars from Voldsminde depot was put into service and kept the operation running). 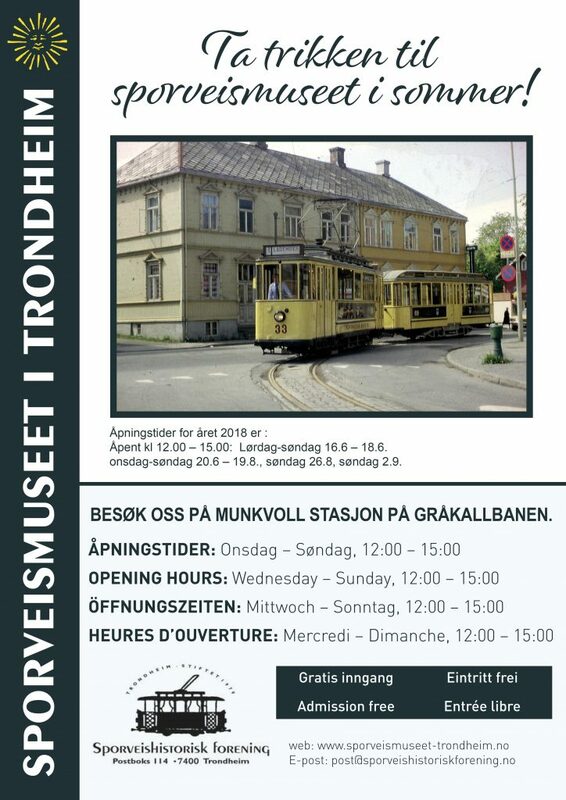 Sporveishistorisk Forening (SHF) was given permission to operate from the old Voldsminde depot which became the main base for the museum society up to 1988. Museums cars were run in tourist traffic on Saturdays during the summers, as well as charter traffic which began to be popular. In June 1988, only one day after the closure, all new cars were transported from Munkvoll to Voldsminde (they were for sale and Voldsminde was situated close to the railway). All the old cars were transported to Munkvoll. Here the society was given temporary permission to use both the new Munkvoll depot and workshops (built 1984), and a permanent agreement to use the old Graakalbanen depot from 1924. The old depot was too small to house the big collection, so the museum society began to look for a solution which included another building. This was a wooden building that had been used for TT’s fleet of cars, tractors and lorries. The City Council granted NOK 128.000 in 1990 to rebuild this garage building to a depot for museum cars/future tramway museum. This building was rebuilt during the next years as a tram depot, including laid tracks outside and between the two depots. The Tramway Museum opened in 1995 and is open to visitors during the summer months. The Trondheim collection is fairly large, but more important, quite complete. Not many towns can boast a list with so few “missing links”. In addition, most of the cars are renovated with many also in operational state. Only a few cars have not been overhauled. Some of the cars are running on charter tours, which have become quite popular.